Learn the basics of installing new sod grass. Spread 4 inches of bark mulch or ground-up leaves around base of garden to insulate the ground and protect the roots. Create a wind barrier by wrapping burlap around the stakes that outline the shrubs. Secure the burlap to the stakes with staples wire. To prevent drying leaves, spray an anti-desiccant onto the shrub’s leaves. Applying the anti-desiccant starting in November, and repeat monthly throughout the winter. When temperatures are below 40 degrees DO NOT spray anti-desiccant. To protect shrubs from snow damage, tie up branches with jute twine. For new plantings, wrap the shrub in burlap and tie with twine for protection from both wind and snow. Burlap Canvas – Cover large areas and obscure shaped shrubs by creating a small tent with a few stakes and a fabric that breathes.. Specialized synthetic fiber material allows light penetration and air flow. 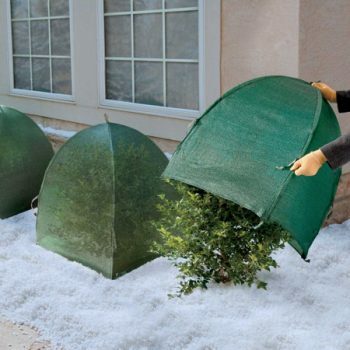 Winter Shrub Covers protects the shrubs from heavy snow build up, freezing rain and winds. Wooden Snow Covers are ideal for protecting against snow damage. Wood Mulch does not cover the green part of the plants, however it protects the roots against the severe freezing cold. One of the best ways to insure your shrubs chances of surviving a cold winter is to select plants that are suited to your climate. Check your hardiness zone when selecting shrubs, trees, and other plants. Plants better suited to these growing conditions are less likely to require winter shrub covers for your location.